The Star Awards are a set of personal development awards designed to indicate a persons ability in a canoe or kayak. The awards give an individual an indication of the areas they need to work on to become more proficient. They are also useful for trip leaders / coaches because they indicate what the group members are capable of – and this helps them plan a suitable trip. There is also a new Paddlesport award scheme which is an alternative to star tests but is oriented towards younger paddlers (under 14). An introductory personal skill award indicating very basic ability. A flat water award reflecting basic boat control that can be done in a kayak and/or open boat (canadian canoe). The first star award reflects the level of skill that people would typically reach after a 6 hour introductory course, e.g. one full day on the water or a six week evening course. Awarded to recognise a good set of foundation skills. 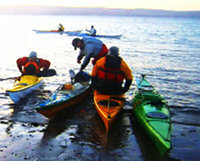 A flat water award covering a range of kayak and open boat (canoe) skills. This award must be assessed in both a kayak and canoe. It should be assessed in more than one location, e.g. a river and the sea, and the padddler must have taken part in more than one club event. Consequently it demonstrates a broad set of skills in controlling a variety of craft in sheltered conditions. A boat specific award reflecting a high degree of personal competence. The paddler should be able to evidince at least 3 club outings of at least 3 hours in the discipline being assessed, and experience of club outings in other disciplines. There are 5 separate awards at this level, each of which must be assessed and awarded separately. An efficient paddling stroke demonstrating reliance on torso rather than arms to enable a larger distance to be traveled. Capable of adjusting the trim of their boat in response to the load carried and the prevailing conditions, with winds no more than Force 3. The paddler should have experience of at least 6 club events in more than one sea location and a river with grade 2 sections. Capable in grade 2 rivers, as part of a led group, able to catch eddies when paddling down a rapid, and paddle upstream in grade 1 conditions. Demonstrating a fluent J-stroke, poling and sailing. Capable of paddling fluently on rivers and lakes, adjusting the boat’s trim, as part of a led group, with winds no more than Force 3. 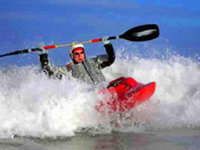 The level of skill, understanding and knowledge demonstrated is of the standard of an able improving sea paddler. Capable in a moderate tidal environment, as part of a led group, with winds no more than Force 4. Equipped with the ability to move their boat with control in the surf, not surfing straight at the beach.Surfs the waves rather than being surfed. Uses dynamic body movement. Engages rails. Demonstrates S-curve transitions and the ability to exit the wave at any point. Recognises the ability to lead a group of 4 paddlers in appropriate locations, in up to moderate conditions. As with the 3 star award, there are 5 separate awards at this level, each of which must be assessed and awarded separately. 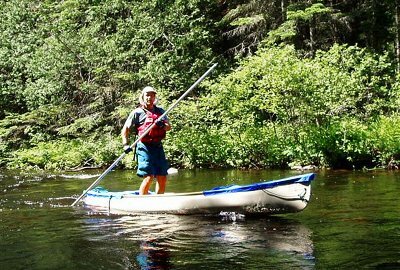 The paddler will personally be comfortable on grade 3 rivers, or moderate Force 4 conditions, confidently demonstrating a high level of boat control, and qualified to lead a group of 4 other paddlers in trips where they would ideally encounter no more than grade 2 water. The 4 star leader award is aimed squarely at skilled amateur paddlers in clubs and societies, rather than professionals working for outdoor pursuits companies, where the cost of attaining and keeping professional coaching qualifications up to date can be prohibitive. Capable of planning trips, assessing and managing risk, ensuring the group safety, and acting as team leader when rescuing is required. Demonstrates good group awareness and control. 4 star leaders are required to have safety & rescue and first aid qualifications in addition to personal skills in group leadership. This award concentrates on how to keep yourself and others safe when paddling. It is an extensive safety qualification covering risk awareness and management, individual and group safety, use of safety equipment, and in-water rescues. It introduces the principle of CLAP : communication, line of sight, avoidance, position of most usefulness. 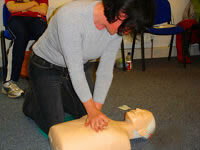 This award concentrates on how to act as a first responder to a casualty, and covers basic first aid including CPR. The level 1 award is the entry level coaching award. Level 1 coaches can operate alone in very sheltered water environments with groups of up to 8 paddlers, only if a supervising coach has provided session guidance and task cards for the level 1 coach to follow. A level 1 coach can manage an indoor or outdoor pool session. Level 1 coaches with the 4* Leader personal skills award can take small groups onto flat water, introduce them to kayaking and canoeing, then take them on short trips in moderate water environments such as the rapids at Shaw’s Bridge. A level 2 coach is able to deliver a series of canoe and kayak sessions safely and efficiently in a sheltered water environment. The course is aimed at Level 1 coaches who feel they are ready to further develop their coaching skills so that they can deliver sessions independently of other coaches. 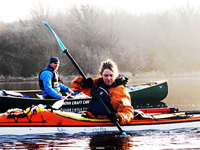 A level 2 coach is a professional coach recognised and qualified to coach at any outdoor pursuits or paddlesport centre in the United Kingdom, and across Europe. The level 2 coach can bring students through their first years of development in paddlesports, and can train, assess and award 2 star personal skills qualifications. A level 3 coach is able to plan, implement and analyse long term development programmes. This is an appropriate level of coach for a person to be in charge of paddlesport activities in a club or centre. It is at this level that coaches begin to become increasingly specialised. All coaches have safety & rescue qualifications. 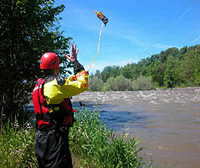 These are extensive safety qualifications covering risk awareness and management, individual and group safety, use of safety equipment, and in-water rescues. They are familiar with the principle of CLAP : communication, line of sight, avoidance, position of most usefulness. A skeg is used to control the tracking of a kayak against wind. With a skeg up, the kayak weathercocks (turns into the wind). With the skeg down, the kayak turns downwind. Adjusting the skeg allows the paddler to control the kayak's tracking between these two angles. Trim refers to how a canoe sits on the water. Trim should be considered both front to back and port to starboard. In general a canoe can be slightly stern heavy when paddling forward, and slightly bow heavy when paddling backwards. However, if the bow or the stern are out of the water the canoe will be extremely susceptible to the wind and very unstable. A solo canoe is paddled up on edge to allow for good body rotation in the J stroke. This however, also makes the canoe an excellent device for catching wind coming from the stroke side. When paddling in windy conditions, the paddler should choose the stroke side to keep the side which is up on edge out of the wind. This is a very good reason for developing a consistent & effective stroke on both sides! An interesting historical note is that the term ‘starboard’ derives from the canoe J stroke. Starboard is a modern pronounciation of the anglo-saxon term steorbord (stearboard), as the fixed rudder was first positioned on the right side of the craft where the paddler turns his forward stroke into the J (most people are right-handed). 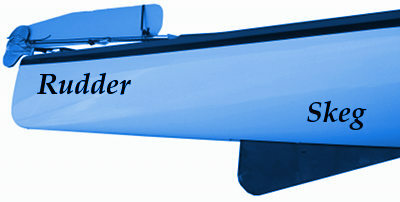 In medieval times the rudder moved backwards and eventually became fixed to the stern-post as the size of craft increased. The term ‘port’ was declared formally into use by the Royal Navy in 1867 to ensure the two sides would not be confused.